Jive offers a wide variety of IP phones for your business, including VoIP handsets and conference phone systems, all at discount prices. A comprehensive list of available VoIP telephone devices is shown below. 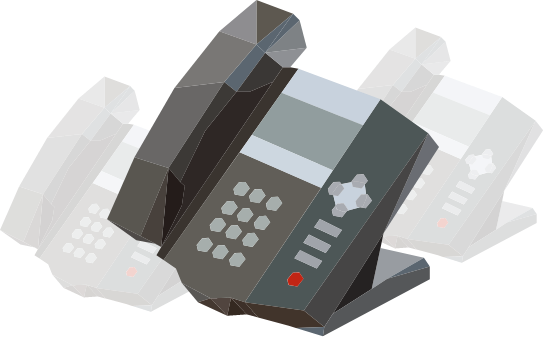 Our phones have been thoroughly tested and widely utilized on Jive’s Hosted VoIP platform. Each VoIP phone purchased directly from Jive comes preconfigured with your account and extension information to make setup simple. A VoIP phone is a phone that uses voice over IP technology to send and receive calls over the internet. Jive’s VoIP phones convert voice and sound into a digital format (Session Initiation Protocol or SIP) designed for cloud-based transmission. This allows for the system to deliver greater flexibility, features, and mobility at a fraction of the cost. Which VoIP office phone option you choose depends entirely on your business needs. For example, VoIP desk phones resemble traditional business telephones, while web-based softphones allow employees to make calls directly from their computer or device using headsets and microphones. No matter which system you choose, no special hardware or programs are needed for your VoIP business system—all you need is a dedicated, high-speed internet connection. The two most common types of VoIP phones are hardware-based and software-based phones. A hardware-based VoIP phone looks like a traditional phone with physical features like speakerphone, caller ID display, and a touchpad and includes call transferring and multiparty calling. All hardware-based VoIP phones can support multiple VoIP accounts, and some are also video telephones that can send and receive image data during a call. A software-based VoIP phone, also called a softphone, is software installed on a user’s computer, tablet, or device. The interface typically resembles a handset with a touchpad and caller ID display, and a headset with a microphone that connects to the softphone might be required to make calls if the user’s device doesn’t have a built-in microphone. Softphones offer similar features to hardware-based phones, such as call transfer, call conferencing, and voicemail. Additional capabilities, such as instant messaging and video conferencing, may also be included. A VoIP phone system gives businesses the ability to make and receive calls over the internet rather than transmitting them over landlines. This is considerably cheaper than a traditional phone system and can be customized to any size of business, from self-employed individuals to large enterprises. A VoIP office phone solution requires little to no physical equipment and is completely portable, so you can take it and use it anywhere you have access to the internet. Benefits and features include call routing, call transfers, conference calling, ring groups, desktop integration, and more. Cloud-based phone systems are managed and maintained by your provider’s server, so your system will always be up to date with the most advanced features and can easily be configured to scale to your organization’s needs. The process of making a call on a VoIP business phone is the same as with a non VoIP phone—simply pick up the phone and dial. VoIP phones use an existing computer network or WiFi to process calls over the internet by converting standard audio to a digital format when transmitting and then converting the format back to telephone audio when a call is answered.